Sacred Heart are a band that sank without trace in 1991 - one of many bands that for whatever reason didnt quite make it. Sometimes bands fail to make it for the simple reason that they're rubbish, but often it's that they're good but for some reason never quite manaaged to become a success. Sacred Heart are in the latter category. 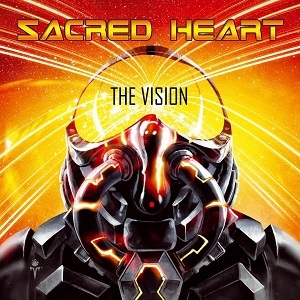 Their EP, "The vision" was only three tracks long, and its now been re-released along with a number of other unreleased tracks and material from the Brian Nemeth Group to make it a full album. Guitarist Brian Nemeth is the best known member of the band and has also been in various other groups - Byron Nemeth Group, Amon-Ra, Electro-Motive-Force, Mercury, Prodigy. For me the biggest problem with this release is the sound quality. I suspect it's down to the limitations of the original recordings that the remastering hasnt been able to resolve, but at times the sound does feel a bit flat and hollow - the drums in particular seem to suffer at times with no real power there at all. Ignoring that, what you have is actually a very good release. It's not going to set the world on fire, but it's definitely an album worth a listen for fans of NWOBHM and 80s rock/metal in general. You've got some good well written songs, some good vocals, plenty of good guitar work and some nice keyboard work - generally its a good solid album. A good album thats well worth a listen.